Local Lincoln teenager is getting her first taste of the disability and social sector – thanks to world first, Immersion Therapy. Ellie McInerney just finished her first visit to Adelaide, for her school-based traineeship with Determined2, a local company that helps people with disability or injury have more freedom of movement in a weightless, underwater environment. Immersion Therapy gives the opportunity for people with disability or injury to move under-water using specialised equipment and the understandings of the biopsychosocial model. Ellie is herself a client of Immersion Therapy, attending sessions at the Determined2 service in Port Lincoln. Ellies’ school provided transport for her to initially visit the Port Lincoln Leisure Centre, where she has been assisting in various exciting roles and continuing her personal sessions. The traineeship also included two weeks where she is able to visit the founding Determined2 at the Adelaide Aquatic Centre and assist with service delivery. Ellie first showed her interest in getting involved during her sessions, where she would help out around the pool. This was noticed by founder Peter Wilson and after a few conversations with the school, this world first work experience opportunity was set up. 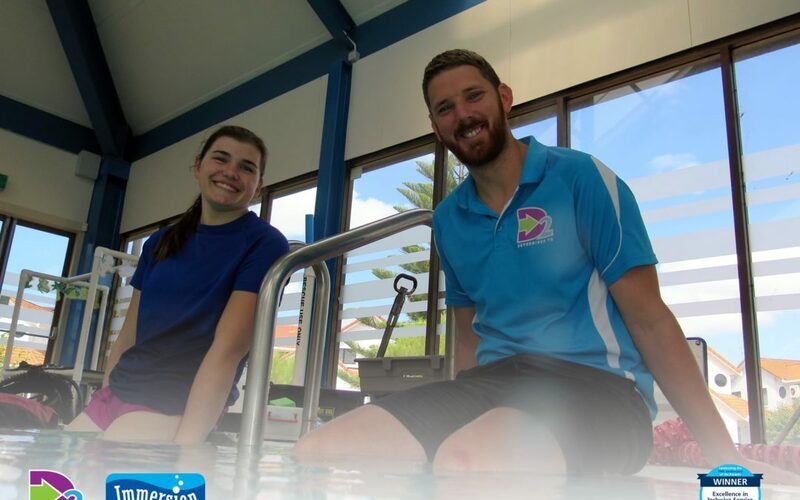 “It’s been a pleasure having Ellie at the pool and we are super excited to be able to provide the opportunity for her to learn what we do and help her find her passion,” Peter said. Ellie recently spent four days with the team at the Adelaide Aquatic Centre, learning more about the company and how it operates. “She seemed to really enjoy her time in Adelaide and we are excited to see what the future holds for her,” Peter said. As Ellie is currently a year 11 student, the traineeship will also contribute towards her SACE. Determined2 is thrilled to have Ellie on board and are excited to welcome more work experience students in the future. Immersion Therapy is being recognised as a world-first service, breaking down the barriers for people living with disability or injury by giving them access to movement and benefits like never before. It has demonstrated great results for those who have participated, winning the 2016 National Disability Awards in Canberra for Excellence in Inclusive Service Delivery. Determined2® is an approved and registered service provider for National Disability Insurance Scheme (NDIS), Disability SA, Return to Work SA/WorkCover (RTWSA) and Lifetime Support Authority (LSA). What is the Biopsychosocial Model? Have a listen to Peters latest radio interview with Susan Wall! Determined2, Immersion Therapy and Give-It-A-Go trademarks are property of Inclusive Innovations Pty Ltd. Website design by Level 14 Productions.